To finish the AFL Fantasy price leaks, we have the 2013 Premiers list for you today. Mitchell and Hodge are DEF/MIDS while Suckling will prove to be a popular defensive option due to his discount. 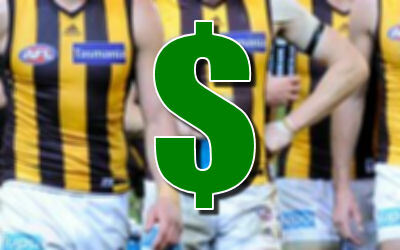 The final prices and positions are out today and it’s a look at the 2013 Premiers, the Hawks. Sam Mitchell ($517,700) leads the list but the exciting thing is that he’s now a DEF/MID. Luke Hodge ($491,900) has also gained DEF/MID status this year. Defender Matt Suckling ($314,400) will be a popular backline option at his discounted price. Jack Gunston if he averages what he did when Buddy didn’t play. It was above 90 points per game.